Song by the band Viva City, released on 23 June 2008. The lyric of the song quotes Kate Bush's Hounds Of Love as well as Shakespeare's plays Hamlet, Richard The Third and The Merchant Of Venice. There are four versions of the track: the original version, an instrumental version, the Kalmes Remix and the Kush Mix. The song has been released as a digital download and as a limited edition white vinyl 7" single. BBC DJ Tom Robinson said: "Viva City’s ‘Kate Bush’ is a storming two minute slice of leery swaggering electropop. Sheer genius." The single was also reviewed favourably by Kate Bush fans on web forums. 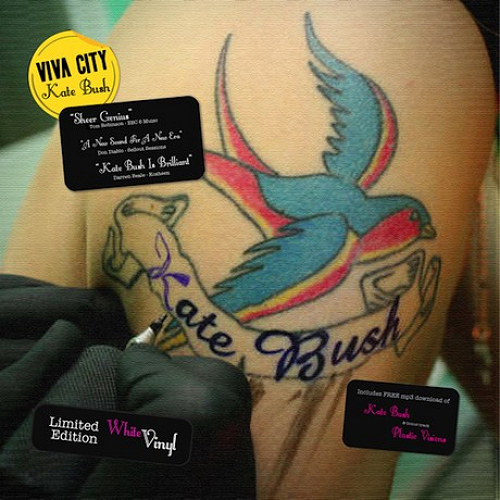 Viva City release their new single, and it's called... 'Kate Bush'. KateBushNews.com, retrieved 5 September 2017. Kate Bush by Viva City. The Sensual World Of Kate Bush, retrieved 5 September 2017.